Specially designed for products with big diameters ranging from 125mm to 230mm, with complete function. Fits various shapes of bottles which capacity is over 3 liters. Composed of SUS 304 stainless steel, with elegance appearance and compact construction. Equipped with high-level HMI and PLC, control function fulfilled, it's all finger job! Enhanced rigid double driving system, able to hold heavy mandrel and ensure safety changeover. 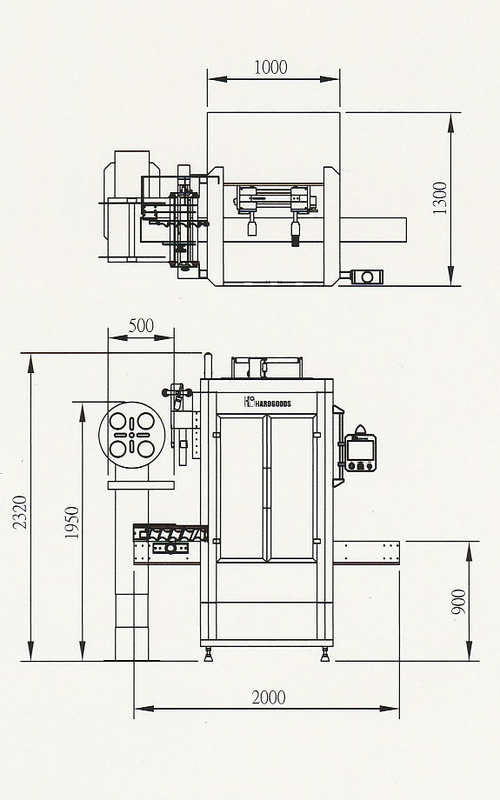 Pneumatic automatic bottle separation device (equipped depending on bottle volume and diameter) helps decrease the cost for changing bottles. Special film cutting system for a wide range of bottles, using standard types of blades for convenient purchase. Safety door proportion 1:3 for best operation and safety guarantee. Overall CE power distribution ensures safety operation. Work with all other auxiliary devices and shrink tunnel, the real machine for your choice. Equipped with intelligent memory settlement when sleeving multiple bottle types at different speed, providing user-friendly and convenient changeover. * All specification and characteristics are subject to change without notice. 10, Jalan Mega B, Taman Industri Mega, 43500 Semenyih, Selangor, Malaysia.